Four women band together to survive the Libyan civil war. Through 11/4: Thu-Fri 7:30 PM, Sat 3 and 7:30 PM, Sun 3 PM, Chicago Dramatists, 773 N. Aberdeen, 773-878-8864, pegasustheatrechicago.org, $30, $25 seniors, $18 youth (13-21). Though Danai Gurira may be best known for her performances in The Walking Dead, Black Panther, and Avengers: Infinity War, in Eclipsed, presented by Pegasus Theatre, she proves that her talents extend beyond acting to playwriting. The first play to premiere on Broadway with an all-black and female cast and creative team, Eclipsed follows the lives of four women forced into servitude as the "wives" of a commanding officer at the end of the Liberian civil war in 2003. Maya V. Prentiss, Aja Singletary, Sola Thompson and Adhana Reid are all electrifying as the four young wives, each processing trauma in her own distinct way. Despite living a waking nightmare, this family of necessity finds unexpected joy and purpose as they struggle to persevere. Prentiss plays Helena, the heartbreakingly young eldest Wife Number One, with a lovely vulnerability, desperately establishing a sense of order for the others and herself. Thompson shows extraordinary range as the youngest and newest Wife Number Four, tumbling headfirst into a life beyond comprehension, wrestling with unimaginably heart-wrenching choices. Singletary delights as the hilarious Bessie, Wife Number Three, who brings unexpected levity to their circumstances. And Reid gives a powerful performance as Maima, Wife Number Two, determined to fight back against her persecution at any cost. In Danai Gurira’s new play, characters cling to their culture, even as they assimilate into America. Wakanda provides most of the fun in this big-screen adaptation. 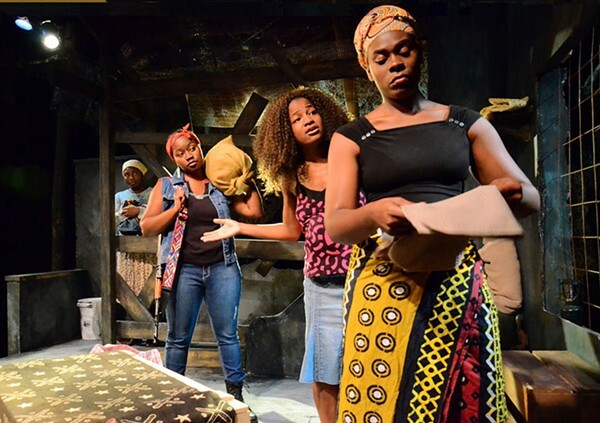 An off-Broadway hit with an undertreated subject: black women with HIV. It promises hope on the other side of defeat. Court Theatre’s production is one of the highlights of the season. Theo Ubique's production is a sweet, sweet piece of Iowa cheese.